The Shanghai Cooperation Organisation will become the world’s most populous regional bloc today when both Pakistan and India formally join at a summit in Astana. The SCO is a Russian- and Chinese-led organisation comprised of six (soon to be eight) members and focusses on political, economic and military cooperation. Chinese President Xi Jinping has highlighted the Shanghai Group’s growing geopolitical clout, noting that admitting India and Pakistan, both nuclear powers, will increase the SCO’s “role and influence”. Some diplomats are also holding out hope that SCO membership may help ease tensions between the two South Asian foes, which have engaged in numerous wars and clashes since 1947. But with border skirmishes ongoing—five were killed in Kashmir just last week—there’s much work yet to be done. 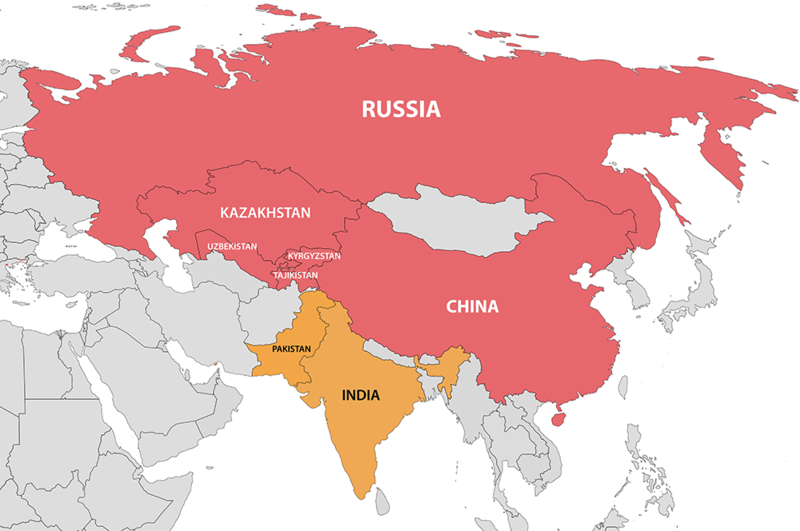 Despite this, India and Pakistan’s accession to the SCO today will enable both countries to strengthen ties with Central Asian states to feed their growing demand for hydrocarbons and strengthen anti-terror cooperation.